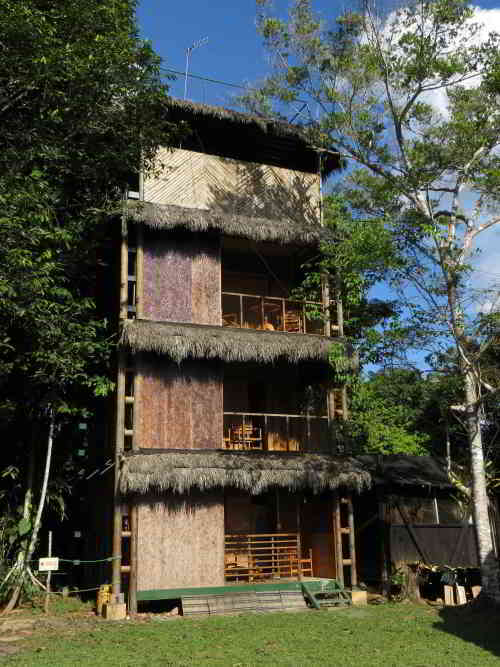 BEST AMAZON PRIMARY RAINFOREST LODGE, ECUADOR? 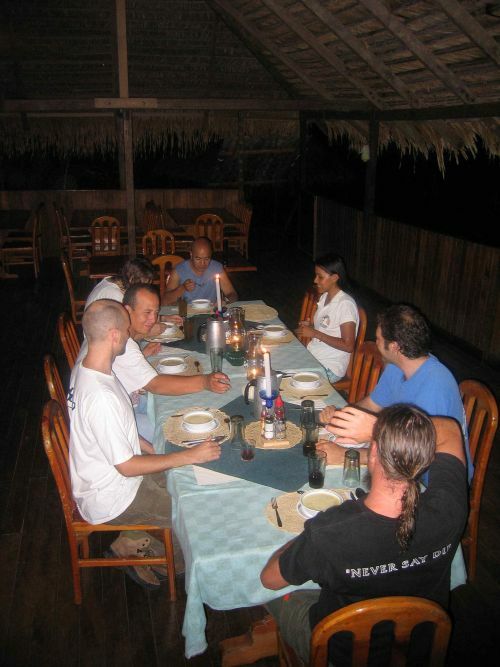 When we started operating in 1986, we experienced from working with our early visitors, that the jungle traveler foremost should be hosted in an accommodation, which would both be in harmony with the rustic environment of Amazon rainforest and attuned to the needs of the modern traveler. As visiting the Amazon rainforest inevitably encompasses some exposure to muddy conditions, getting rained on and/or getting sweaty while on excursion, nothing feels better than returning to a cozy and comfortable lodge with a shower in your cabin. 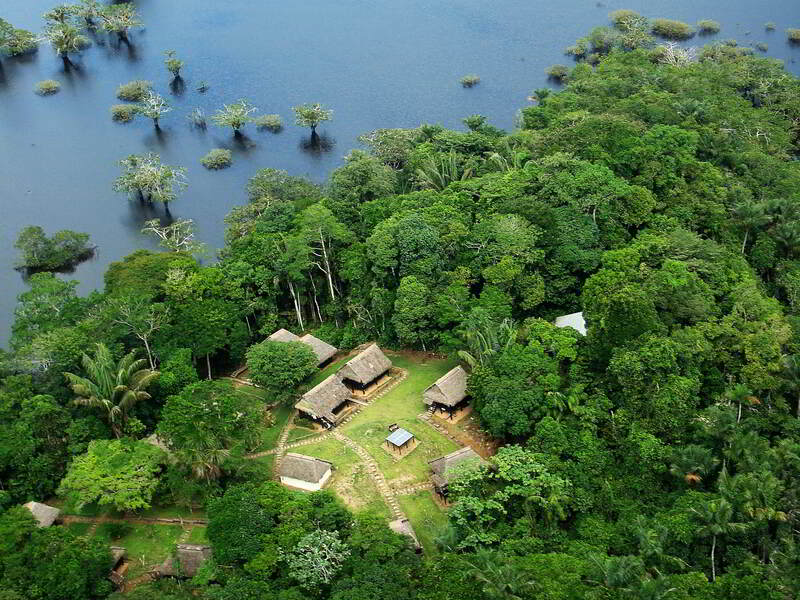 That is why the Cuyabeno Lodge is the perfect place from where to explore the Amazon rainforest. Nothing feels better, than taking a hot shower in a clean tiled bathroom after an exiting excursion through the tropical jungle. Sounds irrelevant to you? Just wait and experience how good it feels after your hot shower, to stroll into in our tidy, well-cared-for restaurant after a day's outdoors in the tropical rainforest. You will love the accommodations at the Cuyabeno Lodge. Being on the best location is also essential. While we explain in on our page on the Cuyabeno Wildlife Reserve why Cuyabeno is the best Amazon national park in Ecuador and probably in South America for seeing wildlife, the location within the reserve is also of key importance. As birdwatching and looking out for other animals must be done very early in the morning, one should ideally be lodged right where the wildlife is. In the Cuyabeno Wildlife Reserve, this is the Cuyabeno Lake system. From our Lodge, built on a seasonal island in the Cuyabeno Lake, you step right out of bed into the place where watching animals is at its best! While visitors coming from most other lodges must first travel 30 to 45 minutes to get to the lake, You are right ON THE LAKE! Our prices are very reasonable as they include lodging, all meals, drinks, transportation and lodging, but wait... We even offer greater prices as we give discounts for combined bookings of Cuyabeno + Galapagos! 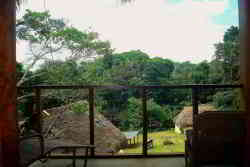 Located on one of the few hills at the lake the Cuyabeno Lake, the lodge never gets inundated like most other lodges at the reserve. 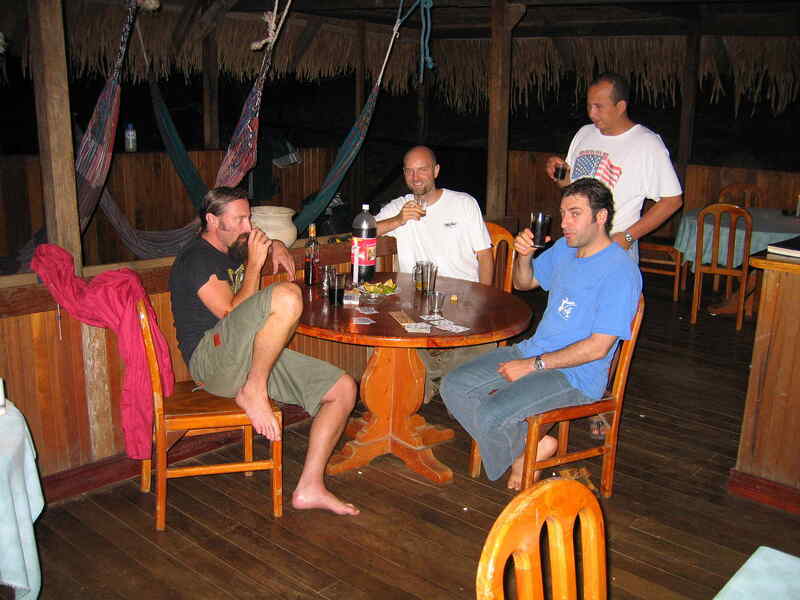 After excursions, our visitors love to hang out on the sun deck, enjoying a cool beer in our Amazon Rainforest Lodge in Ecuador. Of course, after you have been on excursion it is always so nice to return to a clean comfortable place to freshen up and relax. 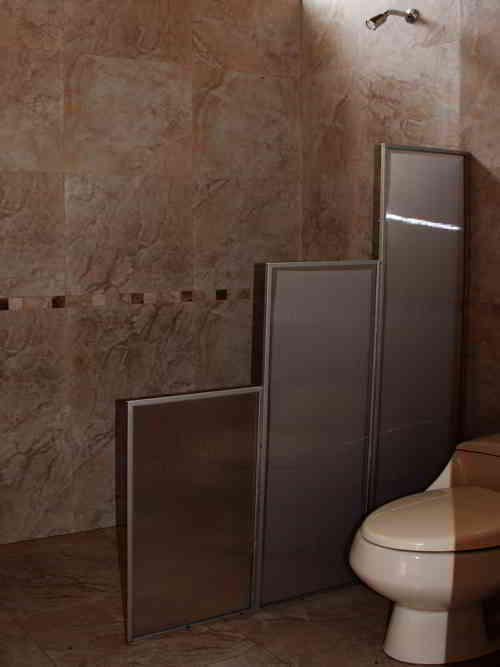 The Cuyabeno Lodge provides such facilities. 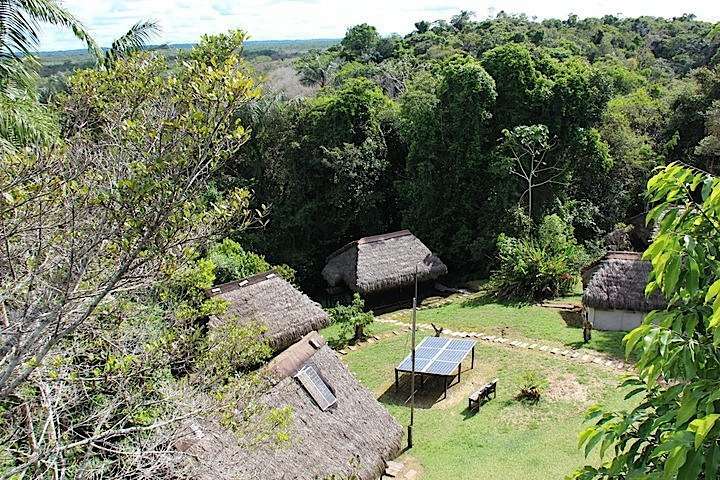 With a modern solar installation, our Amazon jungle lodge, the Cuyabeno Lodge, provides electricity 24 hours per day in all the rooms and the restaurant. So you will always be able to charge your electrical equipment. Our canopy observation tower is the highest point in the entire area, overlooking both tree crowns and the lake, while also serving as our telephone antenna, important in case of emergencies. 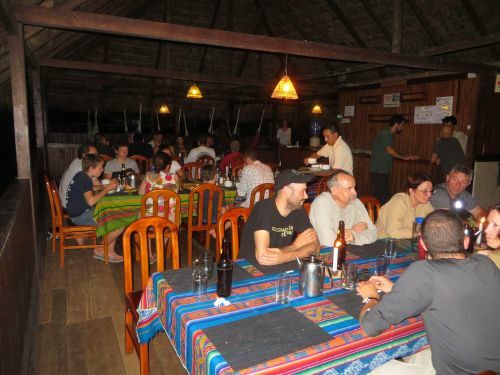 While the Cuyabeno Lodge programs include all meals, and fruit juices served with the meals. We made a great effort to build a functional kitchen where food could be prepared under hygienic conditions. 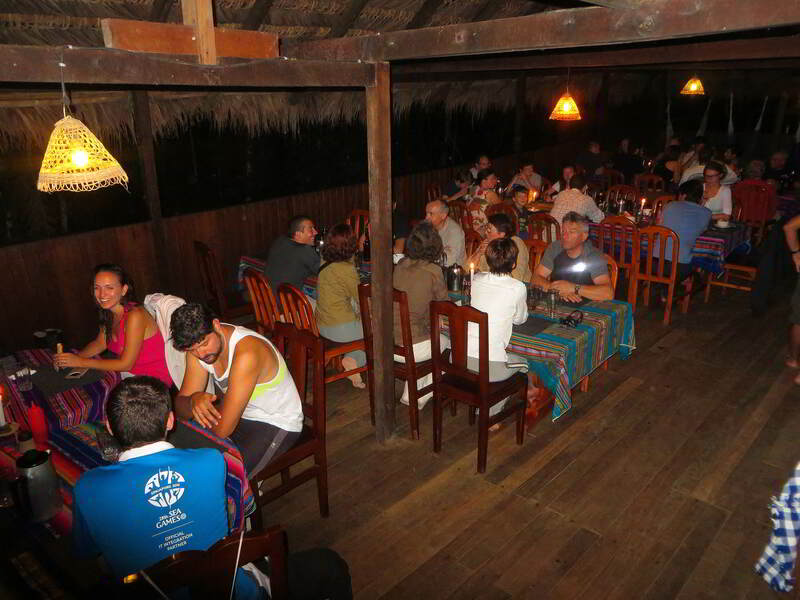 Our restaurant serves a mix of international and Ecuadorian cuisine. 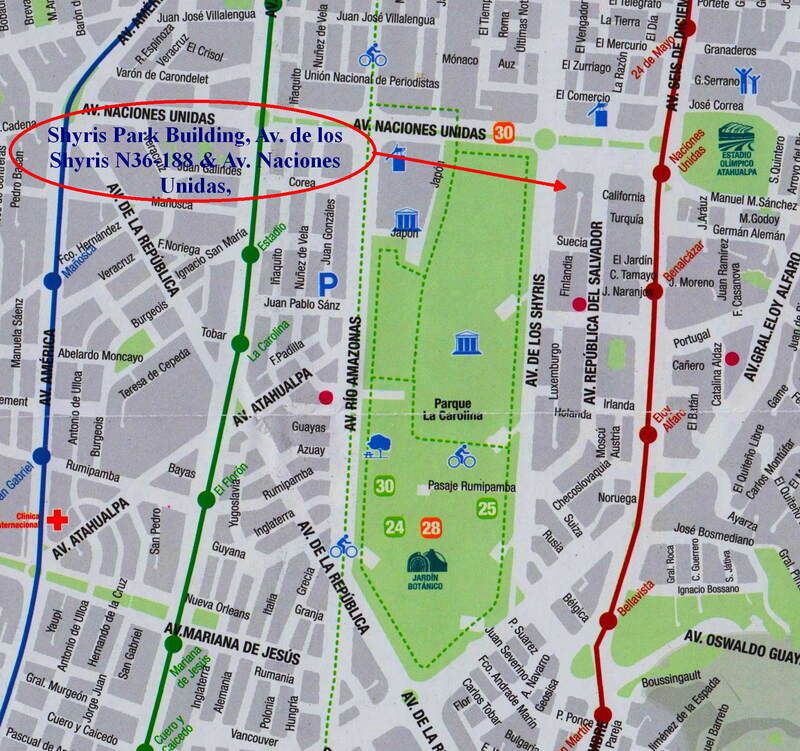 Meals include coffee, tea and bottled water, while additional drinks and beverages can be bought from our bar. 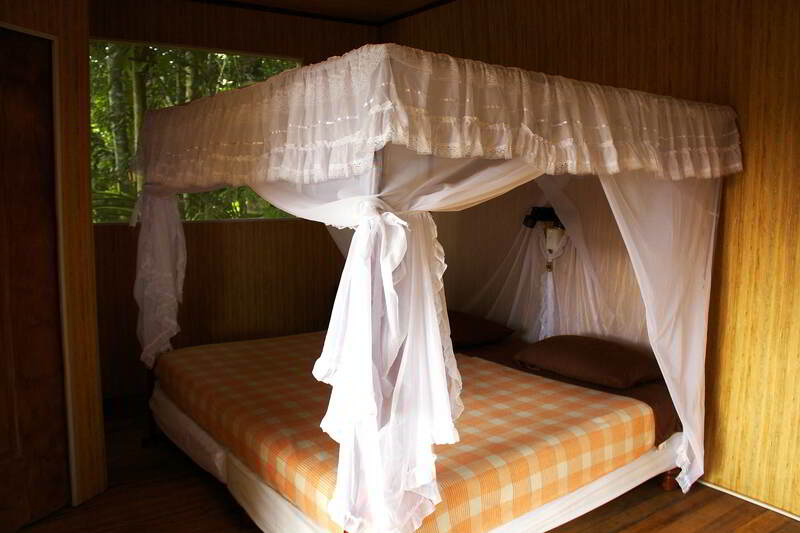 More than anything, the Cuyabeno Amazon Rainforest Lodge, Ecuador, is cozy and fun and it was the first facility in the reserve. 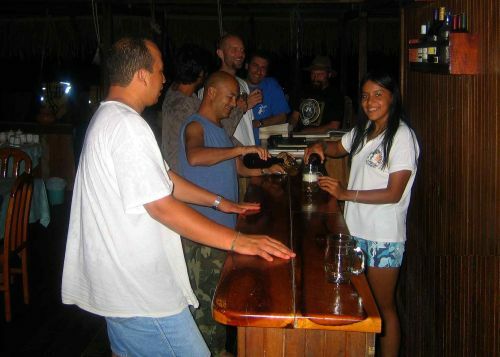 It is a great place to make friends, and many of our guests have found themselves new friends across many borders; Some friendships have now lasted more than 20 years! 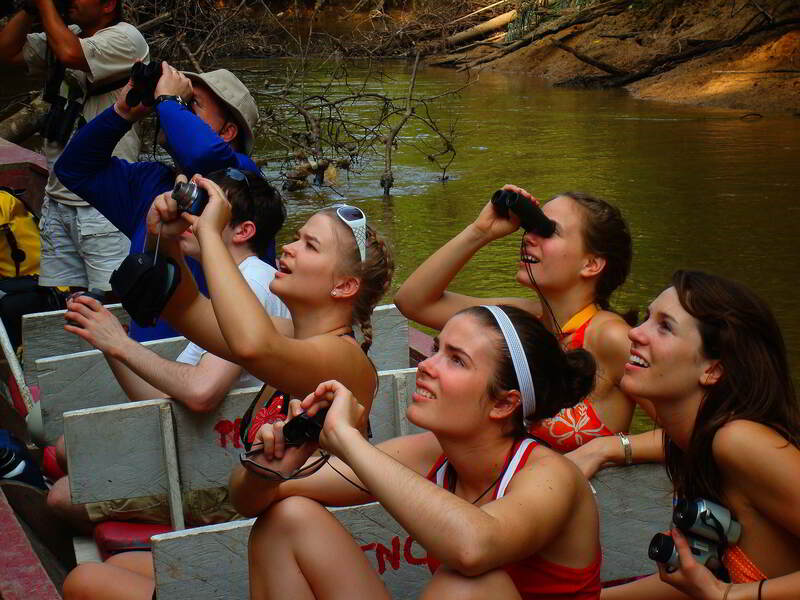 For those with more time, longer stays in the Cuyabeno Faunistic Reserve are possible and highly recommended, as you can explore the park at a more relaxed pace and get to know the jungle and swamps much better. A very popular program is the Ecuador Amazon Expedition to Cuyabeno. 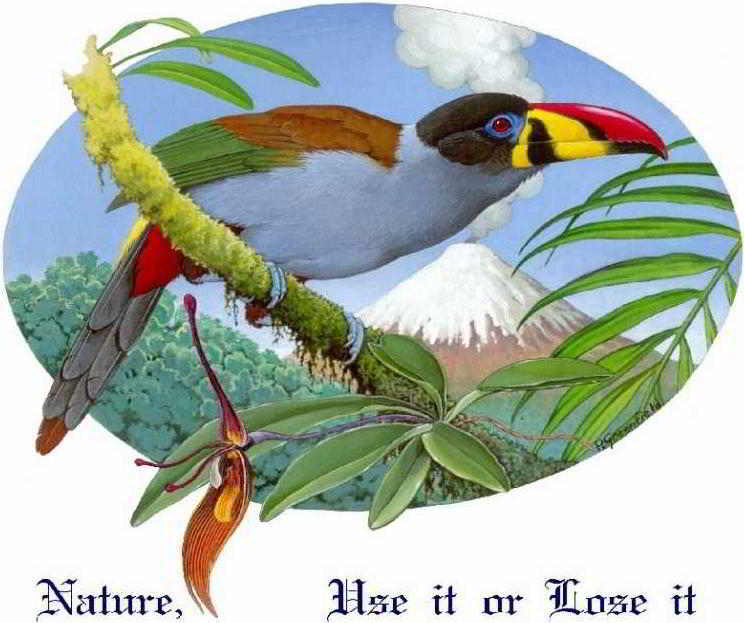 Customized programs can be developed for special theme groups interested in birds as well as other Amazon Jungle Animals and/or Amazon Rainforest Plants. Check our Cuyabeno Lodge rates. The guides of our Cuyabeno Lodge, are widely known for the knowledge about birds as well as other Amazon Jungle Animals and Amazon Rainforest Plants. 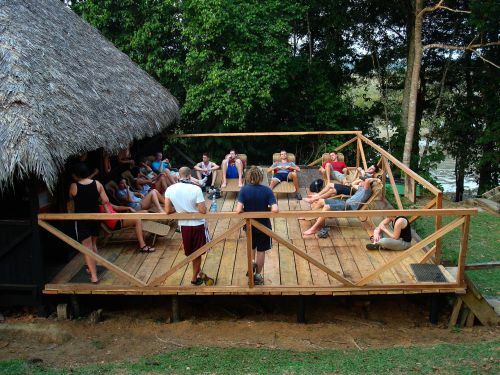 As a final observation, to us as life time conservationists, it is essential that you have time the time of your life. 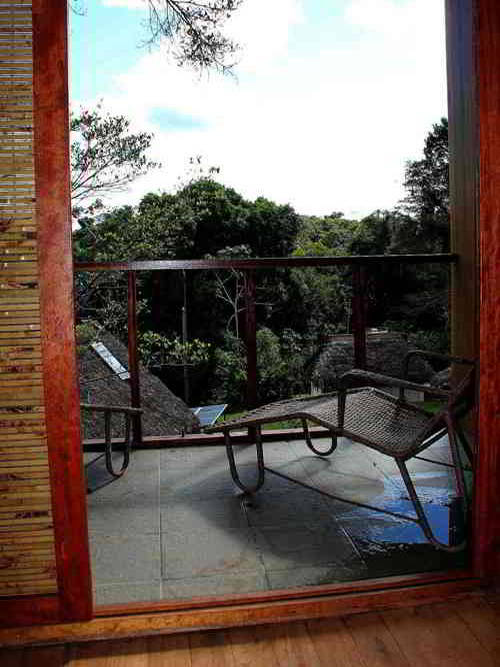 We hope you fall in love with the tropical rainforest, just like we did si many years ago when we stuck out our necks at built our lodge when almost nobody visited the reserve. By visiting Cuyabeno, you help conserving the rain forest. Your visit generates income to the Siona Indians and it strengthens the local economy. Without ecotourism, there would be far less incentive for the government of Ecuador to protect their natural areas. 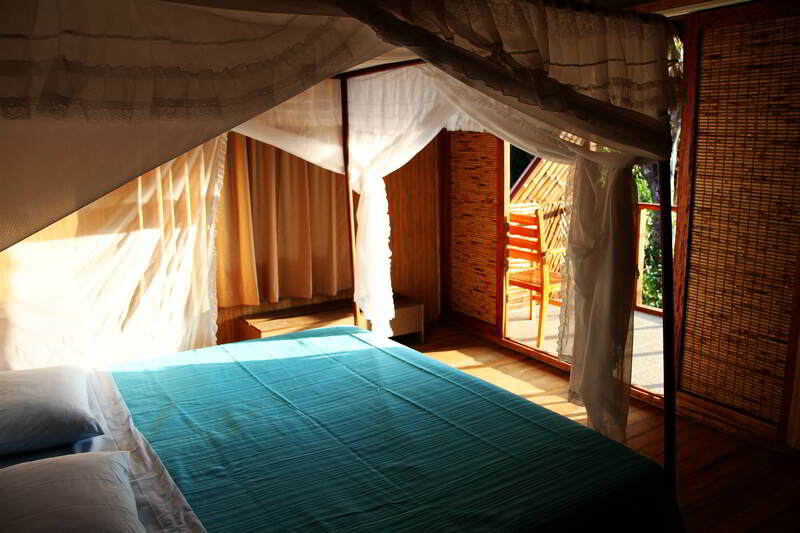 Our motto is "Nature, use it or lose it"
Relaxing in nature: As much a part of the experience in the Amazon Rainforest Lodge in Ecuador as a great excursion. Watching wildlife and birds: exiting for all ages!